And be sure to check out Zezao's amazing myspace page. Thanks to my friend Johanna for introducing me to Zezao! Wow! it would be so cool to see some of that artwork in person! This reminds me of a tragic story in Sydney. 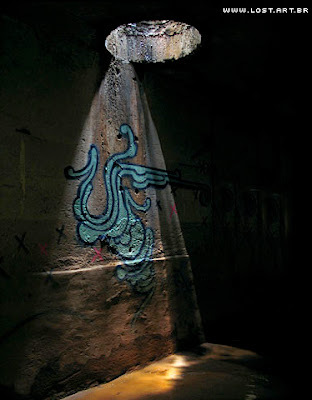 I don't know if you heard, but these graffiti artists, members of the Sydney Cave Exploration Society (I might have to join that one), went to spread their (illegal) art in a tunnel under Maroubra Beach. Which was when the storm started. Two out of three of them drowned in the rapidly filling subterranean passageway (which doubled as a train) and met their fateful ends. The survivor is on suspicion of multiple charges regarding his shop in Kings Cross. Raph: Wow, that is tragic! But I would love to join the SCES! Are there a lot of caves around Sydney? There are quite a few caves around Sydney. Most are above ground, near the beach and natural, but their are rumours of tunnels under the city and proof of tunnels under Maroubra.